He married Madeline Ameigh, May 14 1946.1,6,8 Madeline, daughter of Judson Seely Ameigh & Viola Bell Grover1,6,8,9, was born Jun 4 19261,6,8,9 [Jun 14 19267,10], New York1,6,8,9. 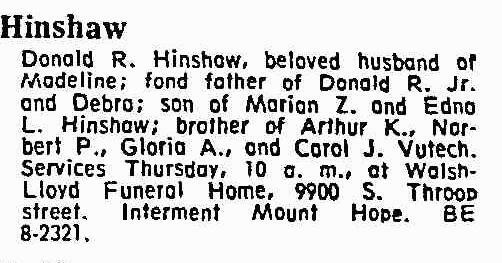 Donald's obituary was published in the "Chicago Tribune" (Chicago, Illinois) on February 20, 196312 (see scan below). Contribution from Nicola Sramek (). Ancestry Family Tree data "Roland J Theetge jr Family Tree" posted by "lydiabeth42454". 1940 census, 121 East Eighth Street, Elmira, Chemung County, New York; roll T627-2514, ED 8-61, page 6B, line #68, household #103. U.S. World War II Army Enlistment Records, 1938-1946. 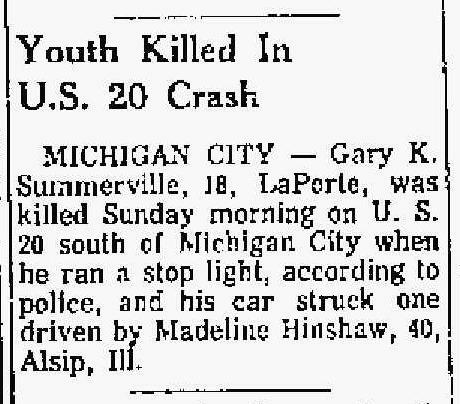 "The Vidette Messenger", May 15 1967; http://www.ancestry.com.